Anderman Ceramics offers a selection of high performance and revolutionary refractory ceramic coating options and corrosion, abrasion and chemical resistant coating products, which can be applied in a large range of materials and components used in different industries. In most worldwide industries, damage to equipment and machinery due to abrasion, corrosion and chemical attack is a serious issue. Research has shown that up to 70-80% of all equipment failures are as a result of surface erosion. For this reason, there is a requirement for a method of maintenance which will prevent further surface erosion, and that method is Aluma Coat. This polymer based ceramic coating compound has been specially designed as corrosion and abrasion resistant coating. It will also withstand chemical attack, and the two variations which can be applied by a variation of different methods will provide resistance up to 150oC, so are ideal for any industry where abrasion and corrosion are a serious problem. Zircoat is a unique refractory ceramic coating compound, which is a great benefit to the industries where corrosion and erosion is a severe problem for refractories and kiln steel shells. It seals cracks, preventing heat loss, and therefore saves heat energy and reduces fuel costs increasing considerably the service life of refractory linings and thermal heating systems. Zircoat is a new specially formulated refractory ceramic coating cement rich in Zircon, and is particularly effective for uses in industries where high temperature resistance is essential. It has been tested to continue to provide protection from slag adhesion as well as chemical resistance and continued strong adhesion up to temperatures of 1500oC and 1800oC depending upon the grade of Zircoat that you choose, making it ideal for uses in combustion chambers, kilns and furnaces. NB - Minimum order quantities apply. Zircoat HT. This coating is meant only for refactories used in furnaces and kilns and withstands temperatures up to 1800oC. Zircoat M. This coating is used in furnaces and kilns as well as on metals, withstands temperatures up to 1500oC. 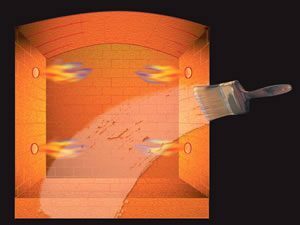 Kiln and Furnace door maintenance and repair. Simple preparation, can be applied by trowel, brush or spray. Mix powder with water to form paste, and add water (depending upon required consistency for method of application). Leave to air dry for 24 hours then slowly raise the temperature to 1200oC (increasing by 25oC per hour), and rise to operating temperature (increasing by 50oC per hour).